Looking for a way to really enjoy those falling temperatures? Well, then you absolutely must check out the new Enzymatic Pumpkin Pedicure at Dashing Diva. Your tootsies will be scrubbed, buffed, lotioned and masked to your heart’s content -- all while smelling the delectable aroma of pumpkin, but of course! I had the great fortune to check out the pedicure this weekend. My pedicurist absolutely went to town making my feet look absolutely fabulous. My fave part? Totally the JellyBath that starts off the entire operation. Loyal readers will remember my description of this unbelievably cool invention from my coverage of the summer’s limited-edition Elle of a Pedicure. (Click here for a recap.) Well, it’s still just as great! My feet soaked in this wondrous jellylicious bubble-like mass for about 10 minutes, and then the scrubbing and buffing and massaging began. And as if that weren’t enough, it was followed by an Autumn Berry Body Buff and the Enzymatic Pumpkin Mask. The mask was literally painted on with a paintbrush and then my legs were covered with hot towels to really let it soak in. These two steps seriously exfoliated away every single dead skin cell on my legs and feet! To finish the treatment part of the process, my legs and feet were then massaged with Orange Spice Massage Potion – which smelled ah-ma-zing and made my skin feel soft as buttah. And while all this was happening, my hands were slathered with ThermaSoft Soyaffin Serum and then wrapped in plastic and big oven mitts – just what they needed, as the cold weather was starting to chap them beyond belief. No more, let me tell you! I picked Kir Royale Kira for my polish color this time – a gorgeous, creamy dusty rose that looks almost mauve in some lights. I’m totally loving it! It was painted on with the utmost precision and just looks beautiful as a pedi color. All in all? Totally an indulgence well worth the time and money. 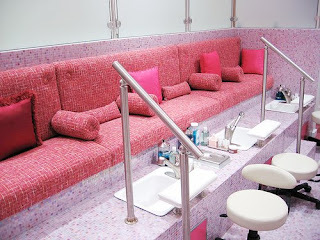 The Enzymatic Pumpkin Pedicure is $75 – check dashingdiva.com for more information on the treatment and salon locations.